Mediacom has teamed up with Realeyes, the latest company to offer so-called ’emotional analytics’. But, with the advertising landscape so chock-full of tech at the moment (even on the creative side – see CMPs and DCOs), do agencies and advertisers really need to be pointing web cams at people’s faces to know if a video ad is good or not? Here are, to my mind, some pros and cons of this new technology. We hosted a Digital Transformation roundtable on rethinking your customer here at Econsultancy’s London offices yesterday and I wanted to share some of the themes that were discussed, and in particular the focus on the customer. Our roundtables are free to attend for Enterprise subscribers. The format is simple. We invite 20 people to come in and chat about an issue under Chatham House Rules (the conversation cannot be attributed). Almost three-quarters (74%) of businesses believe that the user experience is important for improving sales and conversions, according to data in our new User Experience Survey Report. 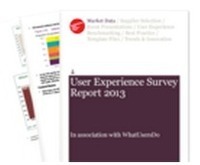 The User Experience Survey Report, conducted by Econsultancy in association with WhatUsersDo, is based on a survey of more than 1,400 digital and ecommerce professionals. The research looks at the approaches taken by companies and agencies, and the challenges and barriers they face.